Manufacturing is no longer the dark, dingy, and dirty work of the past. And throughout the past twelve months, Metal Craft of Elk River has taken action to create better awareness about the opportunities available for Central Minnesota career-seekers. The second-generation family-owned manufacturing facility is part a partnership of fellow Central Minnesota employers who work together to break down myths and misunderstandings about the manufacturing industry. Earlier this year, these employers organized a “Tour of Manufacturing,” where the general public was invited to tour the inside of their facilities and learn about the work that is done within their plants. Metal Craft hosted 140 visitors, which were a mix of students, parents, teachers, community members, and politicians. Metal Craft has a longstanding relationship with area high schools and technical colleges, helping students learn about the vast opportunities that exist for manufacturing careers within the area. “We don’t want students to overlook manufacturing as a career choice and potentially miss out on a great opportunity to have fulfilling work and well-paying careers,” said Read. 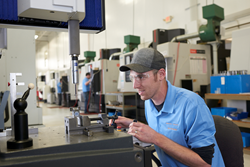 Metal Craft and Riverside Machine and Engineering, which serves the manufacturing needs of the medical, orthopedic, aviation, aerospace, and defense industries, currently employs more than 250 people in a variety of positions and continues to hire on all of their shifts due to continued accelerated growth.